Remove your shoes and put them in the shoe racks. You can use the shoe rack on either side. Wash your hands. Men’s and Women’s rest rooms are located next to shoe racks. Visitors without a proper head covering can borrow scarves provided by the Gurudwara, or otherwise use a large handkerchief. Bow in front of Guru Granth Sahib (Sikh Holy Scripture). Non sikhs are not required to bow but show of respect is appreciated. Everyone sits cross-legged on the carpet in the prayer hall irrespective of their status as a sign of equality. If you can not sit on the floor for some reason, please take a chair. Sit on the appropriate side of the prayer room. 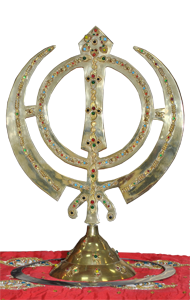 Preacher(Raggi) or a member of the congregation will read from the Guru Granth Sahib. Translation in english is dispalyed on the tv screens on the front walls. Raggi's or members of the congregation sing hyms from the Guru Granth Sahib. After Ardas everyone sits down and Hukamnama (Daily Hymn from Guru Granth Sahib) is read.